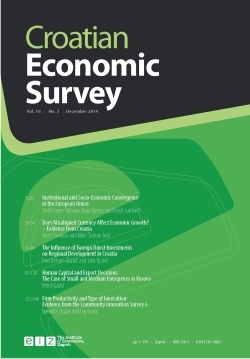 Aims and Scope: Croatian Economic Survey is an English-language, peer-reviewed scholarly journal published by The Institute of Economics, Zagreb, Croatia. The journal aims to serve as a forum for academics and practitioners by publishing high-quality research papers on topics in all areas of economics. Special focus is given to post-socialist Europe. Comparative studies are especially encouraged, since these countries share a similar socio-economic background and comparative studies offer a valuable source of insight for policy formulation as well as a basis for competitive benchmarking. The journal welcomes empirical and policy-oriented papers relevant to a broader international audience. Contributions need not be limited solely to economics; submissions from other related disciplines are encouraged. Abstracted/Indexed in: ABI/INFORM, JEL on CD, e-JEL, DOAJ, EBSCO, EconLit, International Bibliography of the Social Sciences (IBSS), RePEc, ESCI (WoS), and SCOPUS. Funding: The journal is financially supported by the Ministry of Science and Education of the Republic of Croatia. Language of the publication: English. Article processing charge (APC): NO. Nebojša Stojčić (University of Dubrovnik, Croatia). Journal's home page: click here.